Two weeks ago this morning, his life had turned inside out like a winter coat. Instead of having a soft, insulating inside layer, his life felt cold, stiff and awkward around him. He had only been back at work for three days. When the telephone interrupted his doleful train of thought, and he reached for it eagerly. "Orbital Debris Project Office—Jack Haze." The voice on the other end announced, "My canary is dead!" and then waited for Jack to reply, as if expecting Jack to infer the rest. Which, in fact, Jack did. The few words were enough to recognize the harsh, famously taciturn voice of Sol Sugarman at the Boeing satellite factory in Los Angeles. Sol's "canaries" were state-of-the-art telecommunications satellites, one of which had evidently fallen silent. Sol had called Jack because he thought a collision with orbiting space junk had killed the bird. If so, it was an extraordinary disaster. The only spacecraft ever disabled by orbital debris had been a French satellite that had its gravity boom broken off by a piece of an exploded Ariane booster. No complete loss of a spacecraft had ever been conclusively attributed to orbital debris—not even Columbia, although investigating the possibility had given Jack the most harrowing days of his career. Past Sol's intense silence, Jack could hear a sharp conversational buzz in the background. Sol's office was full of engineers and managers, upset about losing their very valuable bird. "Did you get any status reports after it started failing?" Sol rattled off the orbital specifics of the dead canary and the Universal Time of its death and signed off by slamming down the phone on his end. Dr. Yvonne Norhill, who shared Jack's office, gazed at him with an eyebrow arched inquiringly. "Boeing just lost contact with one of their newest comsats," Jack explained. "Those are remarkably failsafe spacecraft. They fail into modes where you can still contact the satellite and troubleshoot. So they think debris knocked it out." "Can something big enough to knock out a bloody satellite be unknown enough to take you by surprise?" "Not exactly," said Jack. "It might have been mistagged, though, if something else crossed its path when it was being tracked to determine the orbit." "Oh, right, it's hard to tell what's what, and they're not like a lost pet—none of them wear a collar that says 'I belong to So-and-So and my name is Blu'." "Half the dogs in Australia are named Blu, B-l-u. Had one m'self." Her fingers unerringly tap-danced across her computer keyboard. On sabbatical from Sydney University, she was exceptionally bright. Not many researchers could tackle creating a computer program for optical detection of orbital debris. She might well pull it off, which would dramatically advance the mission of predicting and quantifying impact dangers. Jack opened his orbital debris database and pored over it. He discovered nothing listed that could endanger the Boeing bird, that he had failed to warn Boeing about. Jack imagined the gleaming comsat gliding in geostationary orbit, and a dark, ragged, nameless piece of space junk in an orbit that intersected the satellite's. The debris silently coasted into satellite. Circuits sparkled, fuel from broken lines spurted in glittering jets. Secondary bodies spun away from the collision. Jack felt strangely cheered. Since his wife of forty years died in her sleep two weeks ago, he had missed her and mourned her every hour of every day and night. Given agonizing personal problems, an impersonal disaster can be a Godsend. Sol's fine-feathered canary was a bloodless fatality, a no-fault disaster, and just what Jack needed to stave off self-pity. Haystack Radio Observatory in Massachusetts agreed to look for the pieces when the canary’s orbital plane went over their radar beam. They had an MIT graduate student to do the tedious work of analyzing the radar return to understand the findings. Jack automatically picked up his chipped but favorite old STS-3 Shuttle mission coffee mug. Then he scowled at it. "Care for a cup of coffee?" Yvonne rose from her chair. "Yes," Jack said, surprised and grateful. He didn't like going into the Exploration Science Office lately. The palpable sympathy of the pretty young secretaries unnerved him. Returning, Yvonne placed the brimming mug and a small stack of mail on Jack’s desk. She was 40-something, thin, sharp-featured though quick to smile, intense and sometimes abrasive. Jack had been less than thrilled when she set up shop in his office two months ago. But office space here at Johnson Space Center was government issue, and as Spartan as the furniture; there hadn't been any other place to put Yvonne while she worked on her optical detection program. Since he returned to work this week, she had given him an unvarnished, bracing kind of sympathy, and Jack was now glad to have Yvonne here. Sipping coffee, Jack checked his e-mail inbox. The senders were mostly NASA colleagues, including several of the usual suspects for sending superfluous e-mail. But one name jumped out at him: Gennady Khlebikov. G. K. was the orbital debris man at the Russian Space Agency, Jack's counterpart. G. K.'s e-mail said, An unprecedented disaster has struck one of the Molniya which stopped functioning 1330:14:55 Universal Time. Now it is dead totally. We know of nothing to hit it. Do you? Oddly no pieces are detected. The Molniyas were the Russians' constellation of telecommunications satellites, with a high-latitude orbital apogee over Siberia. The Russians wouldn't admit that those aging birds teetered on the brink of malfunction and obsolescence. For the record, Jack checked the database. Nothing listed looked like a plausible threat to the Molniya. That came as no surprise: "no pieces" was a dead giveaway that orbital debris hadn't smashed the Molniya to smithereens. It probably died of old age. A couple of hours later, the Haystack Auxiliary radar, HAX, reported no sign of unlisted objects related to the location of the Boeing satellite. It couldn’t locate the canary itself, either. But HAX had a small beamwidth. Sol's canary had been loaded with pressurized cryogenic fuel for its positioning jets. Jack suspected that if it took a hard hit, it broke up explosively. The point where it should have been in its orbit would be the empty center of a wide dispersion of secondary bodies. 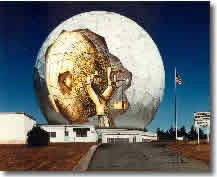 Unlike Haystack, the Naval Space Command Radar Interferometer was a fence sketched across the United States at 33 degrees North Latitude. A fair fraction of all the orbital debris in existence went over that fence at regular intervals. So Jack called Dahlgren, Virginia, to ask the Navy to locate pieces of the Boeing bird and the Molniya. The Navy would be happy to help. They usually were, where Russian satellites were concerned. The Cold War hatchet had been buried in a shallow, well-marked grave. "I better pack it in or I'll be late to rowing," said Yvonne. "I've joined that club on Clear Lake—even though it's not a lake and not clear! I'd rather scuba dive. But not here—not after I've dived on the Great Barrier Reef, with a thousand shiny fish dancing around me, and the corals brim full of life. . . . Anyway, rowing will be a good change from work. You need a hobby too," she added on her way out the door. Building 42 grew quiet, no more voices and doors closing out in the hallway. Jack glanced out his office window. Swarming with cars and pedestrians at 5:00 PM, the whole Johnson Space Center campus had emptied within an hour. A lone rabbit grazed on the expanse of lawn. As a young man, Jack had wanted to be an astronaut. Failing the vision part of the astronaut candidate examination ended that dream. But he'd found a position at the space agency anyway. He stuck to it through three decades of routine bureaucracy punctuated by the two immense tragedies of Challenger and Columbia. Jack had always had Milly to balance out his life. All of a sudden, he wanted to leave the cold mathematical dance of orbital debris for the next generation. He wanted to scuba dive, float in the ocean, surrounded by a thick bright web of life, and just watch the fish dance. A return call from the Navy jarred him back to reality. No pieces, said the Navy. No remains of the canary and nothing left of the Molniya either. They'd continue to look. Odder than ever! Two telecommunications satellites had fallen silent within 12 hours of each other, and neither the Russian military, nor MIT's Haystack, nor the Navy radar saw any pieces. The Molniya had been at a much higher altitude and latitude. It was inconceivable for a huge piece of orbital debris to vaporize first the Molniya then the canary. Nothing that big and explosive was undetected. But Jack did not believe in spectacular but meaningless coincidences. He pushed some papers aside in order to position The Crystal Ball on the center of his desk. The clear acrylic sphere contained an opaque Earth surrounded by a cloud of tiny dots: a three-dimensional rendering of the image of Earth in its cloud of orbital debris that was featured on the Orbital Debris Project web page. Most of the dots clustered in the mid-latitudes of the planet. More strings of the dots ran up over the poles. The dots gave a static, stylized idea of the dynamic gauntlet of debris that every spacecraft had to run. In reality, there were a hundred thousand pieces of detectable debris in a fluid latticework of orbits ranging from two hours to two days. Milly had given him the Crystal Ball on his 30th anniversary with NASA. She got a dozen colleagues and secretaries and to chip in for it. Everybody loved the idea of giving Jack a crystal ball, because the challenge of predicting orbital debris hazards was so formidable as to almost require magic. Jack had never told anybody that The Crystal Ball worked. Gazing at the Ball, Jack stopped thinking. The human mind can make intuitive leaps beyond the pale of any computer. Especially if the human's mind has intimate familiarity with an enormously intricate problem in continual flux. At 7:35 PM California time, Jack was mildly surprised to reach, not voice mail, but Sol Sugarman himself, still at work. "Any word from your canary?" "I have a hunch, tell me if I'm right. Actually, I'd rather hear I'm wrong. Did you lose another bird today?" "I've got your inventory in front of me. The one I'm thinking of is BO 186." There was a silence. "We were just discussing that. What did it?" Sol demanded. "It's not definite yet—I've got the Navy in on the investigation," Jack improvised. "So what's indefinite?" Sol shot back. "Sol, I heard from G. K. earlier today, and he said a Molniya failed. There’s trajectory from that to your canary. The trajectory goes on to a near intercept of the position of BO 186 in its orbit at the time." "A near intercept doesn't mean anything." "Yes. It would have had to change course slightly." 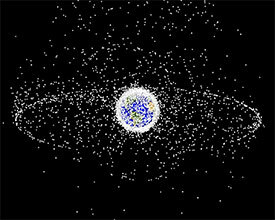 "Orbital debris orbits. It doesn't change its own course!" "Tell me about it!" Jack parried. "But there’s BO 186." "No, there ISN’T a BO 186 now. That’s why I’m taking you seriously." "Did it go like the first canary? Sudden death?" "Yeah. Maybe Spectrum is playing hardball," Sol muttered darkly. "Be advised that we're real interested in whatever you find going on out there. Keep me posted." Jack finally left the office at 9 PM. His thoughts stayed behind, though, and he walked down the hall with its space-poster-decorated walls in an absent-minded daze, until it registered on him that he had heard unusual sounds in the Exploration Science Office. He backtracked and looked in. Invisible but audible, something whirred across the floor behind the receptionist's desk. Jack circled around the desk. Suddenly a small robot dodged around Jack's shoes on its way toward a wadded piece of paper on the floor. The robot extended a claw to seize the wad. Then it did an about-face and zipped to the trash can in the corner. The claw telescoped up above the rim of the trash can, swiveled over the can, and released the wad into the can. The robot was about half a foot high and as wide as a serving plate, which its concave carapace faintly resembled, complete with something on it. The carapace held two pens, three paper clips and an empty CD jewel case. Jack reached for the nearest telephone and called the Automation Robotics Lab. He was not surprised when somebody answered the phone at once. "Your janitorbot is wandering around in the Exploration Science Office," he said. "Yes, your experimental janitorial robot with the trash and treasure sorting algorithm. I read about it in the Space Center News Roundup last month." "Did you say you're calling from Building 42? Wow! It really wandered a long way!" "Not on its own, it didn't! The odds against it randomly wandering across the distance between these buildings, and into this one, are astronomical. Whichever one of you carried it over here for an unauthorized workout in unfamiliar territory had better come get it before I call Security." "Okay," the voice on the other end said meekly. This was the first time he'd forgotten her death completely enough for remembering it to blindside him. It hurt like hell. Reeling, he clutched at the orbital debris problem, as though it were the one fixed point in his world. Jack walked out into the humid night air toward the parking lot, struggling to understand three dead comsats in less than 24 hours. If the news media got wind of it, headlines would shriek, "Junk in Space Strikes Again!" Most reporters and politicians, and even some people in the space business, didn't understand orbital debris. They thought space junk could obliterate spacecraft. It didn't work that way. Unless the Navy eventually found some pieces, it wasn't orbital debris that killed the Molniya and Boeing's bird. At home, the living room couch waited for him, the afghan draped over it looking invitingly rumpled. He just had to fill out some forms from the insurance company. It was onerous paperwork, repetitively asking the same questions, such as "Relationship to the Insured." Husband. Husband. Husband. Then on page seven, Jack realized that he was doing it wrong. They didn't want Husband. They wanted Widower. Utterly demoralized, Jack sagged into the couch. The last night he'd slept in the bedroom was the night his wife died in her sleep beside him. She'd had health problems for months. But he thought she was finally getting better. Heart attack, the doctors said, a shock her fragile body couldn't take. It still appalled him how unviolent it had been. He'd felt a quiver run through her, he'd heard a faint gasp, but before he fully awoke, she was gone. He remembered calling 9-1-1, and the paramedic's brief, brutal attempts to revive her, jaggedly, like a waking nightmare. Jack's tall frame fit on the long couch. That didn't help him now. As wide awake as though lying on a bed of nails, Jack's mind fugued toward his work. Three missing satellites made no sense. 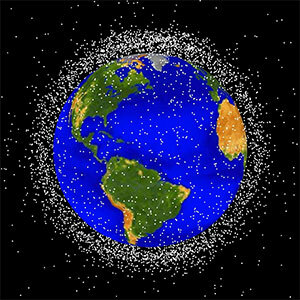 Orbital debris hadn't taken them out—orbital debris didn't work that way. Maybe somebody was stealing satellites . . . ? That was a wild, insomniac-at-midnight idea. But Sol Sugarman had hinted as much, Jack realized with a start. Leafing through the Aviation Week magazines piled under the coffee table, Jack found several articles about Spectrum, an Asian telecommunications consortium backed by three corporations and two governments, none of which had a reputation for fair play. He began to believe that stealing or sabotaging Boeing's birds might, conceivably, be worth somebody's while, at least if the somebody happened to be an aggressive global telecommunications consortium. But why bother the antique tin can, Molniya? There was a venerable rumor that Russian satellites had proximity fuses and would explode if anything intercepted them in orbit. The Russians had been paranoid about Space Shuttle having the capability to bring satellites back to Earth. Anything Russian would represent possible risk and little gain to Spectrum, even if Spectrum were squarely behind Boeing's problems. Meaningless coincidence might have reared its ugly head after all, Jack thought. He snapped off the lamp. Craning his neck to see past the foliage on the potted ficus tree, Jack looked up through the living room skylight. It framed a dark night sky with faint stars. Up there, as invisible as the glass, Earth’s orbital debris whirled merrily, outgassing, freezing, baking, breaking. The parts count always goes up with orbital debris. Not down. Yvonne zoomed into the office at 7:35 AM and discovered Jack already at his desk. "Had insomnia?" "Yvonne, I need your help on something." "Long and hard or short and sweet?" She dragged her chair over. "I woke up early and couldn’t go back to sleep, so I came in and found some really interesting e-mail from the Mountain—the U.S. Space Command." "That’s the mob in Colorado who track satellites and orbital debris?" "Right. Last night somebody under the Mountain discovered a piece of orbital debris missing." "Missing? How'd they know one of a zillion bits of rubbish wasn't there?" "They keep close tabs on debris that might endanger any Air Force spy satellites. Somebody looked at the updates on a piece of debris of concern, and saw a string of zeroes. The updates had stopped. So now it's one for three. Three real satellites are missing and presumed dead—and one old Long March rocket upper stage is missing too." "Crikey! Does it make sense to you?" "Not much. But could you do a computer analysis to come up with a trajectory? I'd like to predict the next event." "Even if you're not sure what we're predicting?!" "Just look at bigger pieces, the ones above twenty centimeters across," Jack coaxed. "And approximate freely." "Nine thousand things whizzing around the planet in all kinds of orbits and you want me to connect the dots! Jeeze!" she complained, with a cheerful glint in her eye. Just before noon Yvonne announced, "Here's a path in space and time." She had it visualized as a line arcing from the Molniya, high over Siberia, to the canary and on to BO 186. "And look, it extrapolates right on to this object. Whatever it is, I’d give it six to one odds of being next in line." "89-181A-3. A daughter body from the breakup of the booster of an Ariane rocket launched in 1989." Jack was already speed-dialing Haystack. 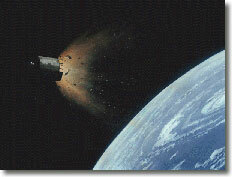 "There's an impending collision between two pieces of orbital debris," he told Haystack. "I'd like you to image it. This might be a windfall of data on impact dynamics." "Cool!" said the grad student at Haystack, whose name was Jin-Chu Wang. "I contact you as soon as I have results, bye." Yvonne stared at her computer workstation. "What I’ve got here is not a very straight path. You did say to approximate freely. It’s a bit erratic, actually." Jack nodded. She had confirmed his Crystal Ball intuition, he thought with grim satisfaction. Orbital debris doesn't change its own course. But this enigma could do just that. Images from HAX sequenced across the monitor of Jack's computer workstation. Jin-Chu’s face occupied a window in the monitor. The digital camera perched on the monitor reciprocated with a live image of Jack and Yvonne that went back over the Internet to Haystack. The radar image was a blocky shape painted with false-color amber flecks: low-resolution radar pointillism. Jin-Chu explained, "Look, that's the target object. No resolution on its details—sorry—radar just sees blobs but we could learn a lot from the movement after the collision when blobs fly everywhere. Now there's the intruding object." It was a sparkling pointillistic blob, moving relative to the target. "But look! The second guy, the intruder, changes course. It accelerates away and we don't see it any more!" "Why it do that? What is it?" asked Jin-Chu. "Ah. I show it listed as 97-023D," said Jack. "An old Long March upper stage. It's disintegrating and releasing gas at erratic intervals, so it changes course." Yvonne had protest written on her face. Jack made a calming hand motion out of range of the digicam. "Bad luck," Jin-Chu sighed. "My dissertation could use collision data." When the disappointed Jin-Chu Wang signed off, Yvonne said, "You told him the designator for the one the Mountain noticed missing—the Long March piece! It didn't just go walkabout, y'know! There's a path from the Russian satellite, to the Boeing comsats, to the Long March piece, to that non-event just now." "Yesterday Sol Sugarman hinted that one of Boeing's international competitors might have sent up a satellite-stealing spacecraft. Maybe it knew it had been seen as soon as the radar beam from HAX hit it. Or maybe it's semi-autonomous and it's learning the difference between orbital debris and valuable satellites." "Satellite-stealing spacecraft? Are you serious?" "I know. It's unheard-of. But I take a hint from Sol as seriously as I'd take a feature article in Av Week. Sol's got the highest signal-to-noise ratio of any man I've ever met." "A robotic spacecraft would not have a straight, inertial trajectory," she mused. "Not if it's got steering jets and it’s making course changes." "Exactly. It makes a kind of sense. But I don't want to tell that to Building One. They might say the mental strain of bereavement was getting to me." "It has been, but not like that," Yvonne agreed. "So in my daily activity report, the object that appeared on the verge of colliding with the Ariane booster piece is 97-023D. Long March upper stages are notorious for explosively disintegrating. One of those could be outgassing, causing what we just saw. Between you and me, though, you're uncovering the trail of something else. Between us, let's call it—Blu," Jack improvised. Yvonne laughed. Jack's nights of broken sleep had begun to tell. He tried to prod his brain toward further useful thought. "Did Blu intercept, but avoid, anything else so far?" "Fair go! I hadn't thought to ask that question. I don't have rowing tonight so I'll get a start right now. You should go home and have a lie down. You look exhausted." The thornier this problem got, the more Jack was glad to have Dr. Norhill on his team. "Yvonne, I hope I'm not sidetracking you from your own research for a comedy of errors. That happens in this business. Orbital debris threats can turn out to be phantoms of miscalculation." "I imagine so. On the other hand, if it's not a miscalculated false alarm, then it's something that's going to shock everybody to the back teeth, isn't it?" In his study at home, Jack forced himself to finish tonight’s self-assigned quota of insurance paperwork. He had a half-load of wash in the laundry room, not because that many clothes needed washing, but because the dryer's thumping purr made the house seem less dismally quiet. Jack wore a flannel bathrobe over his pajamas. Milly had trained him to a certain standard of domestic decency everywhere except the bedroom. In the bedroom, they'd learned over the years how to be gloriously indecent with each other. He missed Milly terribly. When they first met, almost forty years ago, he'd been smitten by her dancing brown eyes. He'd thought Camille a wonderful, exotic name. He still thought so. Jack jumped when the phone trilled. "You shouldn't have answered on the first ring. It means you're up brooding," said Yvonne. "Anyway, your phone here in the office has been ringing itself silly. I finally picked up, and there was an excited Japanese person on the line. I put 'im on your phone mail. You might want to hear what he has to say." After listening to Kazuhiro's recorded message, Jack moved to his computer to check his e-mail. He quickly confirmed that Kazuhiro was far from the only orbital debris specialist firing off agitated calls and e-mails this evening. Staring aghast at the string of "highest priority" e-mails, Jack imagined Milly saying, You're up to your anatomy in alligators, my dear. He could almost hear the wry, kind tone of her voice. He could all but feel her laying warm hands on his shoulders. Well, go get 'em! With his adrenaline level ratcheting up, Jack composed and sent an e-mail message. It was 10:15 PM Central time—6:15 PM in Hawaii. The recipient might still be in the office or have his laptop on this evening, learning that Jack had an outlandish favor to ask from the Air Force Observatory on Haleakala. When Jack arrived at the Exploration Science Office the next morning, he found the coffeepot wafting out the aroma of fresh coffee with a distinctive not-coffee overtone. A note taped to the machine stated in outraged pink High-Liter, "NEXT TIME BREW NORMAL COFFEE! I HATE THE TASTE OF HAZELNUT!!—Y.N." Jack poured a full mug. He needed the caffeine, with or without the hazelnut additive. On previous occasions, Jack had observed bad temper on Yvonne's part preceding a breakthrough in her work. She was running true to form today. "Blu did pass right by another one," Yvonne announced. "Left a working satellite alone. It was a French science satellite in a polar orbit looking at auroras." Holding his coffee, Jack leaned over her shoulder. "And look, with the course it's on now, it's got something coming up, one of those new low altitude telecommunications satellites. Think it'll go for it? —How can you stand that reeking stuff?" Jack placed the aromatic mug on his desk. "What's the next most popular dog's name in Australia after Blu?" he asked with an edgy alloy of eagerness and dread. "And the one after that?" "Oh, Skip, then I guess Jedda," said Yvonne. "Why?" "It's not just Kazuhiro in Tokyo with their weather satellite. The guys under the Mountain spotted more pieces of debris missing. Then on e-mail I heard from my counterpart in the European Space Agency, and G. K. again. There are more satellites AWOL. I think there's another round going. Maybe even a third. All doing the same thing as Blu." "Fill me in on the satellite next in line for Blu." Jack jotted down what she told him. Suddenly his concentration vacillated back to his grief, as he realized that Yvonne might well be the age of a daughter he and Milly never had. Jack might have tried harder to have children with Milly if he'd known how lonely it would be to be left by himself. Yet, incredibly, life was going on. Right now it was going like an avalanche. Yvonne had barely finished giving Jack the rundown when a call came from Colonel Archer, USAF. "Good morning, Jack." Archer sounded matter-of-fact. Jack had never heard Archer use any other tone of voice. He was an impressive man who had little need to resort to verbal special effects. "If your request came from an academic researcher, I'd send it straight into the round file cabinet on the floor. In your case, I'd like to hear your reasoning." Jack took a deep breath and explained the situation, emphasizing the involvement of Sol Sugarman. Jack knew Sol had been behind more than one spy satellite built for the Air Force. Colonel Archer had oversight of the Air Force Observatory in Hawaii. Situated at a high altitude, on the barren crown of the volcano Haleakala, the optical telescopes could image spacecraft in Earth orbit to a stunning degree, subtracting atmospheric effects to get images as detailed as they were highly classified. Best of all, by imaging in the optical part of the electromagnetic spectrum, there wouldn't be a telltale radar beam to alert Blu or its handlers. "I see. You’re proposing that the Observatory witness the attack on the next satellite," Archer said. "Hear about the Russian spysat?" "My counterpart in the Russian Space Agency says they lost one last night." "Not just lost. It blew up. Their spysats have proximity fuses, and that one thought something was tampering with it. You may be down to two intruders. Which is two too many," said Archer. "Call the Observatory and make the arrangements." While Jack waited to be connected to the technical director of the Air Force observatory, Yvonne gestured for him to look at her workstation, where she had been incorporating Jack's new data points into her trajectory calculations. "Look, you're right. There were three of them, Blu, Skip and Jedda, before Skip blew itself up by meddling with the Russian spy satellite. Anyway, three, and the first thing they each attack is at geosynchronous altitude, high up." Yvonne's brow furrowed. "D'ya think the satellite snatchers have a mother ship parked at a LaGrange point?" "Hell, I wouldn't know," said Jack. This business had now cantilevered itself out of his field of expertise to the realm of sheer guesswork. Yvonne sat back, folding her arms, and scowled at the computer. "Or is something completely different going on?" Several hours later, Jack, Colonel Archer and Sol Sugarman were connected across the Internet, with the same image on each of their workstations, streaming to them from Hawaii in real time. Yvonne looked over Jack's shoulder. The image from the observatory showed a dark oblong object. It had three slender, flexing booms at least a hundred feet long. A huge and yawning maw opened up. And then a boom curled, tapping the luckless satellite, and the satellite tumbled into the gaping maw and disappeared. Yvonne jumped. Stunned, Jack stared speechless. "Those long parts look like feelers to me," Yvonne squeaked. "Same here," said Archer. Sol's mouth just hung open. Stars shone faintly through Blu's body. Opaque only in the center, Blu faintly glowed around the edges. Its whole shape gently pulsed at long intervals. "The thing looks alive!" said Yvonne. She was right. It even had what looked like a wide flat eye near the base of its feelers. Sol sputtered, "It ATE my CANARY!" "They can't be intelligent," said Yvonne. "Skip got blown to bits, and that hasn't fazed Blu or Jedda at all, hasn't stopped the behavior." "What do they do besides eat?" asked Archer. Jack shrugged. He mind felt slow, stuck in molasses-like disbelief. "You got the name dead right," Yvonne murmured to Jack. "Blu 97-023D. 'You are what you eat,' and all that, and it ate the Long March upper stage quite early on." "What's next on the menu?" asked Sol. "How soon will something of national security value be attacked?" said Archer. Yvonne turned to check her workstation. The drive lights intermittently flashed as it churned the huge debris database to factor in the new data points she'd given it this morning. Yvonne tapped a few keys. "Yikes!" "I'm not sure, hate to say and get a false alarm up!" Jack grew alarmed. It wasn’t like Yvonne to lose her confidence. Jack leaned closer. "Blu is heading toward— The International Space Station." There was a moment's shocked silence followed by a minute when everyone talked at once. "They've got a lifeboat!" Sol finally yelled. "Tell the crew to come home in the lifeboat!" Yvonne blurted, "If it were me, I wouldn't leave an entrée aboard what might be an hors d’oerve!" "It sometimes passes on objects for some reason," said Jack. "Why? It avoided two things that we know about. Haystack even saw one of them. Why?" "Because Haystack caught it in the act!" Nose wrinkling, Yvonne abruptly reached toward Jack's abandoned coffee mug, which was still almost full and stalely reeked of hazelnut, and shoved it further away from her. Jack tried to think past a howling caffeine-and-sleep-deprivation headache, wracking his brain for a pattern. "No. There's more to it than that. What Haystack was using, the beam it sent out, came from Haystack Auxiliary. HAX. It was radar in the radio K-band. Ka to be exact. The other object Blu approached but didn’t eat was a French science satellite transmitting in the K-band." Then everything came clear to Jack. It was like the times he'd seen classified images from the Air Force Observatory, blurred and indefinite until the atmosphere-correcting computer program kicked in, then a startlingly distinct and unmistakable picture. "K-band radio repels it," Jack told the others. Jack's gaze fell on the coffee mug exiled to the far corner of his desk by Yvonne. "Maybe radio tastes bad to it." "Could transmitting K-band save my birds?" Sol sounded galvanized. "It's what I'm going to suggest ISS do," Jack answered, seizing the telephone. "We'll soon see what happens." The International Space Station could make itself a very noisy spacecraft. The astronaut/cosmonaut crew had two communications channels and a data downlink simultaneously transmitting in K-band radio and S-band too for good measure. One comm channel blared music—Hector Berlioz' Symphonie Fantastique, from a cosmonaut’s personal CD. On the volcano in Hawaii, the Air Force watched intently. Blu coiled up its feelers and veered away. It zeroed in on a derelict Pegasus upper stage instead. Shortly thereafter Jedda was averted from a Department of Defense satellite which, for once in its life, had been instructed to advertise its existence, transmitting nonstop in K-band radio. Meanwhile, Lassie appeared. Lassie promptly feasted on a defunct weather satellite, watched with riveted fascination by the Liquid Mirror Telescope in Arizona. Jack and Yvonne hurried to Johnson Space Center's Building One for the most unexpected and high-profile meeting of Jack's career. "What the hell do I say? Invaders from outer space?" Jack could imagine the story in the evening news, and in the National Enquirer, and himself in a glaring spotlight of publicity. "That would stretch the point, wouldn't it? The things are dumb as fence posts. Skip got blown up by the Russian satellite, and the other two stayed right on course." "They target technological space artifacts. Nobody in the astronomy community has discovered any missing moons or asteroids. If that continues to hold true, then Blu and its pals are from— from—" As the implications sunk in, the hot, sunny day turned glassy and unreal for Jack. "My God. They have to be from where a civilization has begun spacefaring, or attempted to. Why would something exist to devour spacecraft in orbit? Is this a cosmic scheme to keep civilizations at home?" It was a sickening possibility. The blue sky hid the infinity of stars above their heads. Yvonne abruptly held Jack back from crossing Saturn Lane as a car sped by, the driver chattering on a cell phone and oblivious to the fact that the space program's universe had changed overnight. Yvonne said, "If each live satellite and spacecraft transmits the right kind of radio as soon as Blu or another one approaches, they'll only eat orbital junk. And devour that with gusto. You know what cleaner shrimp are?" "Cleaner shrimp. Little beggars that live around some species of big fish like groupers. The cleaner shrimp help themselves to particles of dead matter on the fishes' skin and even in their mouths. The fish don't eat the shrimp because the shrimp are doing them a favor. It's good hygiene and all." They entered the JSC campus Mall. "Planetary cleaner shrimp?" said Jack. "There would have to be many other planets with satellites and orbital debris—enough orbital debris in the galaxy to sustain a species that lives on it." "We don't know what their metabolism is," Yvonne amended. "The debris may be supplemental nutrients. Or broken down for propellant mass." Jack gazed across the JSC campus with its expanses of bright green grass and widely spaced white concrete buildings. Between one footfall and the next, a vivid syzygy of ideas lined up in his mind. "It doesn't make any sense for such a species to evolve naturally. But they could have been designed to solve the orbital debris problem somewhere. An artificial species that proliferates on its own, crosses the distances between the stars on its own, doesn't have to be expensively maintained and carried to new places. But does show up where orbital cleaning needs doing!" Bright as she was, Yvonne raced to the corollary that had just begun to glimmer in Jack's imagination. "Then somebody has a large flock of worlds that need to be kept clean. An interstellar federation or Union or some such? Woo!" she drew a hand across her brow as they turned on the sidewalk to Building one. "If that's the case, then we are not alone—at all!" Jack imagined other worlds, hubs of space exploration and commerce, attended by Blus and Skips and Jeddas which fastidiously cleaned up the orbital jetsam that was a byproduct of space travel. Chills of dread and wonder ran down his spine. "Not being alone could be good, or it could be very bad!" "I think humankind will cope somehow. Who knows? It could be all for the better. Fortunately, you don't have to predict that—just tell management what we've seen." Yvonne gave him a quick hug as he opened the door. In a momentary gale of escaping air-conditioned air, they tumbled into Building One. "Planetary cleaner shrimp!" Yvonne declared, and almost collided with three dour, business-suited Building One people on their way out the same door. "But Jack, they might put you out of work!" "Then I can retire," Jack replied. "And take up scuba diving."